Too many passwords to remember? Do you forget passwords? Do you keep passwords written down? Writing down password is a bad idea. I cannot remember more than a handful of passwords. So what is the solution to password? Password Safe – Password Safe is an Open Source (free) tool that allows you to have a different password for all the different programs and websites. It only works on Microsoft Windows. Password Gorilla – A Tcl/TK PasswordSafe clone that runs on Microsoft Windows, Mac OS X, and most flavors of Unix, including Linux and Solaris (note that it requires Tcl/TK to run). pwsafe – It is a unix commandline program that manages encrypted password databases. Good for remote access over ssh. Use gpg command, which is encryption and signing tool. Revelation is a password manager for the GNOME 2 desktop. 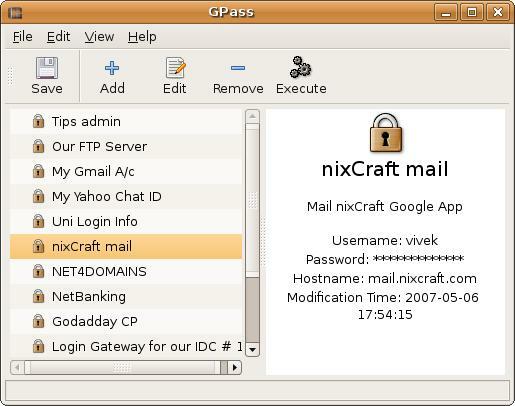 GPass is a simple GNOME application, released under the GNU GPL licence, that lets you manage a collection of passwords. The password collection is stored in an encrypted file, protected by a master-password. Make sure you backup ~/.gpass directory. 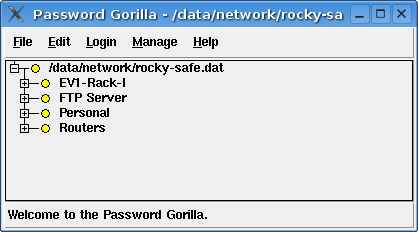 My personal favorite is Password Gorilla as it can be used to store any logins and passwords. Retrieve them by either sending them to the Clipboard. You will get a dial box asking password and database name. Since this is first run, you need to cancel dialog box. Click on menu File > New to create a new database and a password, If you lost master password there is no way you can get back your login information. So keep password database file at safe place.